I can remember getting the email from Karen, "Echo is having her pups ..... "
You are the BEST dog ... we love you! My( now) husband and I had been working on remodeling our new house the whole summer, and our wedding was coming in fall. We had had many conversations concerning the need for a dog for companionship and protection. My husband is away often in the winter and I didn't want to be left alone in an empty house. We had had many discussions about possible breeds, Jack Russell Terriers, Labs, and GSD's. After much talk about pros and cons of each breed, we discovered we each had a fondness for the GSD. With the breed decided, I set to work trying to find a good breeder. Shadow Valley Shepherds response was quick and friendly. The beauty of Wooly and Annie caused me to search no more. Both parents featured outstanding qualities and favorable lineage and we couldn't wait for our new pup. After a very long drive, from Milwaukee Wi. to Caro Michigan, I got to meet my new pup Bear. Bear was as beautiful as I had imagined him to be. He behaved well on the 8 hr ride home, sleeping on my lap most of the time. My husband and the rest of the family, (including our other new baby, a kitten) immediately fell in love. As a pup, Bear was by far the most well behaved, most calm puppy I have ever had. Bear grew to be a handsome, loyal, well behaved dog. His obedience trainer loves to work with him and has urged us to complete the Canine Good Citizen Award. Bear listens well and everyone comments on his great temperament and his beauty. He has not once displayed any aggressive behavior to people or other dogs. He keeps a protective eye on children and babies and is incredibly gentle. Bear is definitely the best dog I have ever had. My husband and I plan to continue with his training and we hope to turn him into a backpacking companion as well. Shadow Valley produces wonderful dogs! We are the very lucky owners of "Shadow Valley's Happy Meadow", a Wooly/Annie pup from last year. Just wanted to let you know what a joy she is. She is by far the most jolly, enthusiastic dog I've ever met! This proved challenging with my three year old twins around! She loves them soo deeply. It's very clearly in her eyes. She adores everybody, actually! Now that she's older and fully trained, we are just enjoying every moment of her. Anyway, I just thought you might like to know how she's doing. Gorgeous, friendly, smart, devoted, mindful (finally!). We love her. Thanks! Sulley has brought us so much joy and laughter, and filled the void that was left when we lost Que in May. Thank you so much. May God bless you and your family throughout the new year. I'll keep you updated if you want to know how he's doing in classes. I think from puppy class we'll get his good citizenship certificate (or whatever it's called) and then maybe some agility classes. I'll see how he likes going to school and take it from there. He'll be the smartest one in the class. He already comes, sits, lies down and shakes hands, and he's only four months old. He is so smart I can't believe it. He's great with my nieces and nephews, but a little rough with the cats (to be expected, only puppy stuff ya know). Health #1. Our dogs are all house dogs not kennel dogs. Our children are raised but now have the grandkids at our home all the time so temperament is a must. I made the decision I had to have Wooly puppy and flew back to get my new girl Shania, also brought back a male for a friend that loved his puppy to. The trip back Michigan was well worth the time meeting Karen, her dogs and especially meeting Wooly in life. I was very impressed with her set up also the wonderful temperaments her dogs had. Four years later now Shania is exactly what I expected wonderful temperament loving children so much and NO dog aggressive, NO health problems ever, her hips are good OFA rating good and is not minored out in points and has a major reserve. puppies. We get wonderful comments from all people that have purchased them. working titles. Karen stands behind all pups that are bred at ShadowValleyShepherds. I have been myself a breeder for 35 yrs in the German Shepherd breed and very proud to have a part of ShadowValley GSD in our pedigree now. Texas joined our family four years ago. It was our hope that he would fill the shoes of our beloved long-time companion who had passed away only a few months before --- a tall order for a ten month old pup. But Texas has turned out to be one of the finest canines with whom I have had the privilege to share my home. Initially purchased as a pet, his good looks, confidence and movement earned him points and a major reserve in the conformation ring within his first six showings. He is truly exemplary of conscientious breeding: excellent temperament (a wonderful and gentle companion to our two year old son), structurally sound, and handsome --- possessing a machismo that prompts strangers to stop us and ask "where did you get that dog." 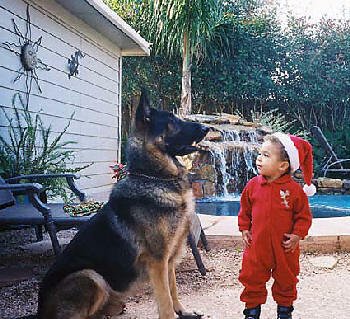 One of my proudest moments was when a Texas Ranger stopped me to tell me that my dog was one of the finest German Shepherds he had ever seen. He is fine indeed. Thank you Karen and Karey for our beautiful boy. We have 3 Shadow Valley German Shepherds "Teddy Bear" which we purchased first from Karen, and we liked him so well, we bought a female, Josie and then got Alabama. They are wonderful dogs, excellent temperament and some of the best bloodlines in the country... When Teddy Bear first came to us, he did not make up to me as soon as I had expected, (as he was only 10 weeks old) as he had gotten attached to Karen. One day when he had only been here a week or so, he left the back yard and I went looking for him and he was out front looking to the North with the most unusal look on his face, like he was looking for someone. I said "Teddy Bear" what are you looking at? Michigan? looking for Karen? he looked at me for an instant and wagged his tail and then looked back to the North. I said, "But you are an Ohioian Dog now, Karen wants you to live with us" ... At that moment he turned to me and came running and we bonded right then and he has been my loyal companion ever since. He has done so well in the confirmation ring, in obedience and all around companion that we truly love him as part of the family. Thanks Karen for the wonderful dogs and hopefully you will always be there for your friends at C&J German Shepherds. We heard about Shadow Valley German Shepherds through a patient of mine. My wife and I have been looking for a companion, and I personally have an affinity for shepherds since I grew up with them. We were looking for the right temperament, and it was a blessing to discover Karen and her shepherds. Karen is happy to answer any questions that you have and even advices you with raising a puppy. But raising MJ (a baby of Addie's) is such a breeze. He is incredibly smart and such a sweetheart (mama's boy!). The boy has personality! He is very athletic (loves to catch tennis balls) and maybe sometimes, is too brave for his own good. MJ is a star in obedience school. When people see MJ, they never fail to comment on what a gorgeous puppy he is. Last week, as I was walking MJ, we came across an empty plastic milk jug on the street. MJ picked it up and carried it all the way to home and without me cueing him, he proceeded in dropping the plastic jug in our recycling bin. The kids that were waiting for their schoolbus at the corner of our block noticeably dropped their jaws after witnessing the feat. This is a testimony that Shadow Valley produces some of the best shepherds in the land! We are blessed to have Karen and MJ and we hope and pray that we have long wonderful years with our handsome boy!